Born in 1947 in Voorburg, the Netherlands, Bert Hermans is living in Rotterdam. Since the late 80s Hermans has been a passionate painter. He owns a studio in the historic city center of Gouda. His work consists mainly of oil paintings. His mayor theme is industrial and cultural heritage. He took up various courses in acrylics, water media and oil painting at the Dutch Stichting Kunstzinnige Vorming Rotterdam. He further developed his technique by taken up courses at the atelier of Clara Miedema, Rotterdam. Hermans has had exhibitions in the Netherlands, Italy, Spain, Germany. , Austria and the USA (San Diego, Miami, Las Vegas and New York). 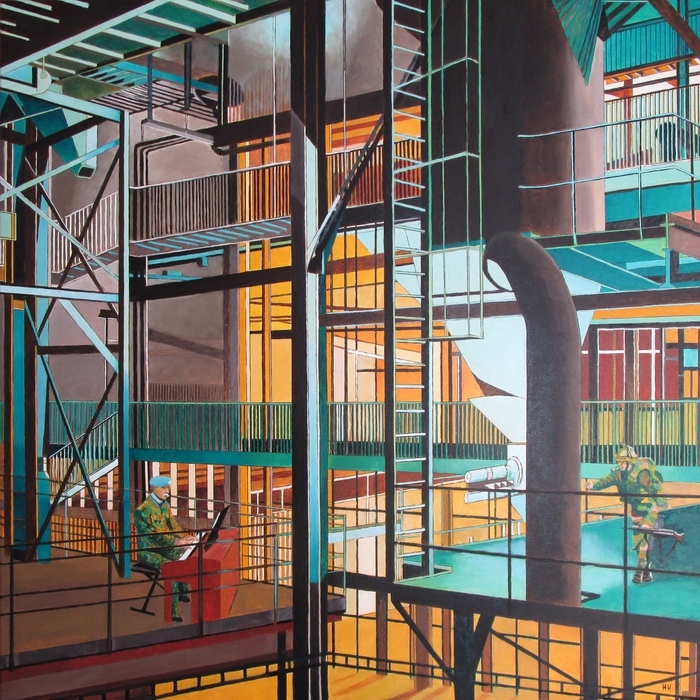 The main theme of Bert's work is industrial and cultural heritage. Sources of inspiration for his paintings are abandoned and often ruinous buildings. He records these often before demolition by photographs and sketches. These are worked out in his atelier at the Vest in the historic city centre of Gouda. Use of colour and use of light make his paintings special events. Dark disconsolateness is changing into light and warmth. Regularly he adds characters into his paintings who provide another or an extra dimension to the image. The tension in their relation is sometimes nearly tangible. Besides the oil paint for the top layers he mostly uses acrylic paint as ground-colour or priming. In several paintings he has used gold foil, acrylic modelling and glazing gel. This painting was inspired by a visit of Bert at the opening of the exposition 'Little Treasures' in the Galeria de Marchi in Bologna in November and december 2015. 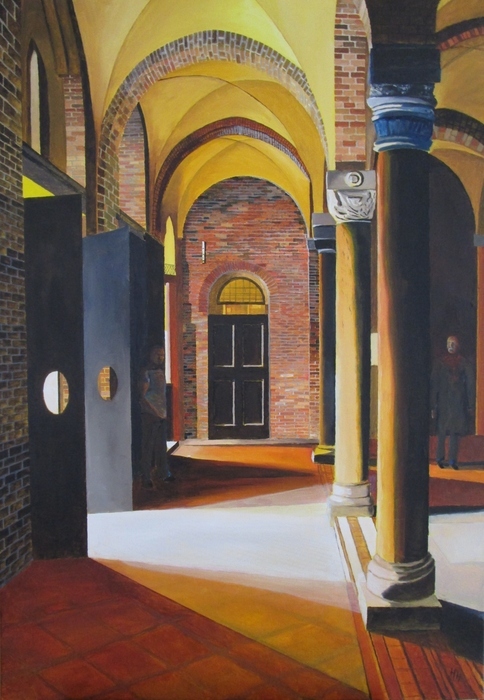 During his stay in Bologna he brought a visit to the church Santo Stefano and the porch of this church with its special light inspired him to making this painting when he was back in the Netherlands. In the painting two figures can be distinguished who hide themselves in the shade. The basilica consists of an interweaving of seven religious buildings that are surprisingly interconnected. According to tradition, San Petronio, the Bishop of Bologna, had the idea of creating a basilica after the Holy Sepulchre in Jerusalem. It was built on top of a temple dedicated to Isis. The buildings that make up the complex are all very old. Because of the numerous restorations in the first decades of the 20th century, the look of the complex has changed from the original “Seven Churches” to four. Despite this, it is still one of the most romantic and interesting monuments in the city. You enter through the Church of the Crucifix. Of Lombard origin, it dates back to the 8th century. The painting was inspired by a gangway of the old 'Pennsylvania state prison'. Bert was in his working life a teaching professor at the University of Nijmegen (at the end of the 70s and the beginning of the 80s) and the many visits with students at prisons in the Netherlands and abroad created a source of inspiration for his paintings. This painting is one of a series of paintings that inspired Bert by a visit to de old factory CHV Noordkade in Veghel in the Netherlands. Bert situated in this strange environment a demonstration against the ruling regime of president Ilham Aliyev. International pressure has been exerted on Azerbaijan to release its number of political prisoners. Since joining the Council of Europe, the Azerbaijani government has released one hundred political prisoners, but many remain in custody, and opposition supporters continue to be detained without proof of wrongdoing. A number of persons of the Democratic movement of Azerbaijan like theTalysh national minority activists including Novruzali Mammadov, Atachan Abilov, Arif and Junus Leyla are recognized as political prisoners or refugees by the international organizations. On the background of the painting you will recognize the modern apartment buildings and the TV tower of Baku in the moonlight. This painting is one of a series of paintings that inspired Bert by a visit to de old factory CHV Noordkade in Veghel in the Netherlands. Bert situated in this strange environment one the worst cases of Dutch post war history. The scene was situated in July 1995 in Srebrenica, Bosnia. The Bosnian Serb general Ratko Mladic was at that time shouting at the Dutch commander Thom Karremans. “Don’t tell me nonsense”. “Answer my questions! Did you give orders to fire at my troops?” The commander Karremans with moustache looked exhausted (in the painting sitting behind a piano, in contrast to reality). He rubed his eyes, and mumbled something about a piano. “I’m sorry?” asks the interpreter. Karremans elucidates: “I am a piano player. Don’t shoot the piano player.” Mladic shouts: “You are a poor piano player. Are you a married man, do you have children?” Nobody could miss the implicit threat. Instead of shooting the piano player, Mladic’s soldiers shot about 8,000 Muslim men whom the Dutch were meant to be protecting.